Massage in Mysore. | The Lotts Yoga. My plane to Bangalore was a cute little one with propellers. I sat next to a young woman on her first ever flight, and we had a very interesting conversation about her family, and forthcoming arranged marriage,to a young man she had only met twice so far. I was met on arrival by the charming Managing Director of Indus Valley Ayurvedic Centre, Satyajit Sengupta and his driver. We chatted on the three and a half hour journey to Mysore, only stopping for lunch in an interesting roadside restaurant. Indus Valley Ayurvedic Centre (IVAC) Is just outside the city of Mysore at the foot of the Chamundi Hills. Ayurveda is one of the oldest surviving holistic medical systems in the world. Together with Yoga, Ayurveda gives us the means to lead a healthy, conscious, and fulfilled life. 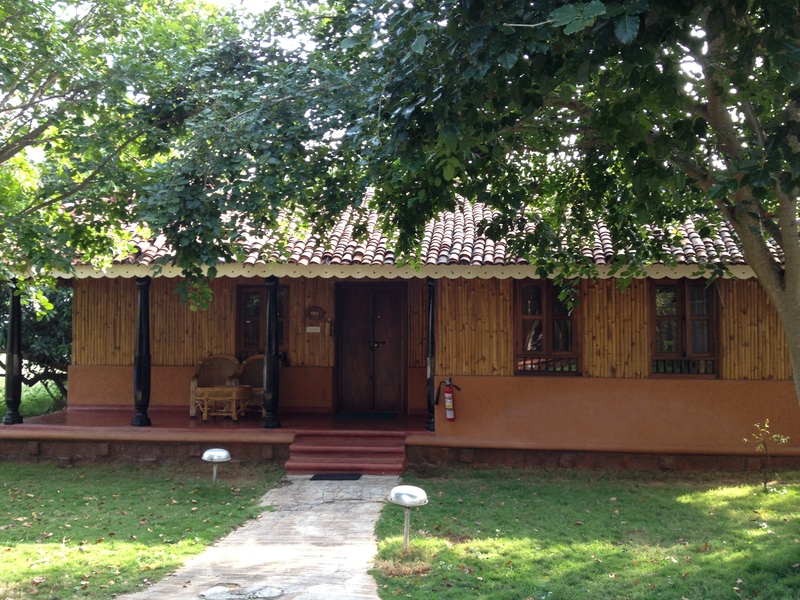 I awoke refreshed the next morning, in my large and very comfortable traditional cottage, which was set amidst Neem and Sandalwood trees in the natural gardens of the centre. After breakfast – all food here is Ayurvedic and dosha balancing I had a consultation with one of the Ayurvedic doctors. She recommended diet , lifestyle suggestions and treatments for my dosha. As my foot was still sore from my fall on the holy mountain in Kerala, my first treatment was a wonderful leg and foot massage in one the amazing treatment rooms. During the afternoon, I had a tour of the whole place, had a swim in the huge pool, saw the doctor again, and learnt how to make a Rangoli – traditional folk art pattern. The next day, after breakfast and another check in with the doctor, I had the most wonderful massage. The therapists start by chanting a prayer. Then treatment commenced with a head and neck massage by one therapist while a second bathed my feet in a flower filled copper bowel of scented warm water.. and this was only the beginning! Then lying as God made me on a vast massage table two therapists work on the whole body together.. I can see you all flocking to try this.. just to let you know women have women masseuses and, sorry guys you have men!… The treatment ends afer an hour or so with a shower and a detoxing cup of green tea. In the afternoon I was accompanied into the city of Mysore in a tuk-tuk (Great fun! 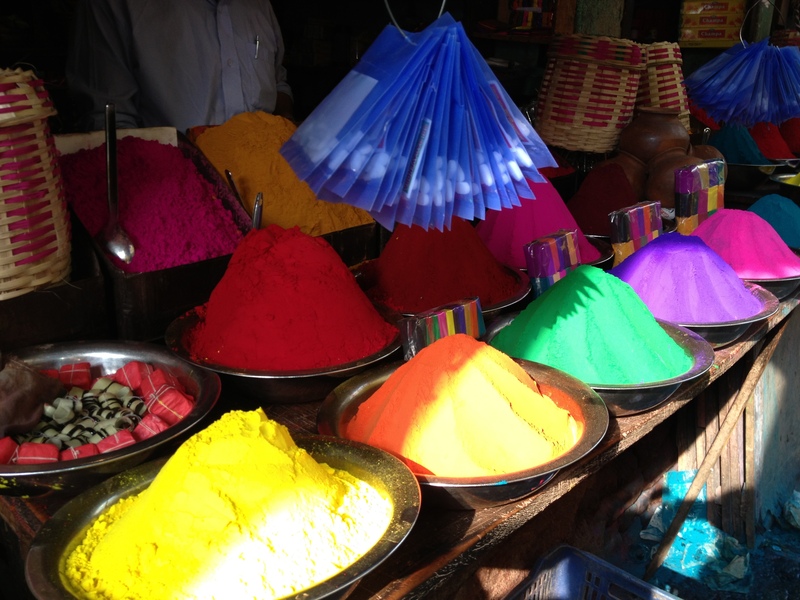 ), we toured Mysore Palace, and shoped in the local markets. Its a city full of hustle bussle and colour. On my final morning, Satyajit took me to meet the founder of IVAC, Dr Krishna , at his home,which is set in the grounds of the centre. He is a pediatric anesthesiologist by profession, also a writer and speaker at the world medical congress. His vision was to bring Ayurveda to the forefront of modern medicine, thus he founded the now world renown IVAC. A charming and gracious man. It was a lovely way to end my wonderful three day ayurvedic experience, before heading back to the delights of Goa.